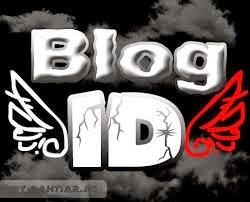 This is a Must read!!! 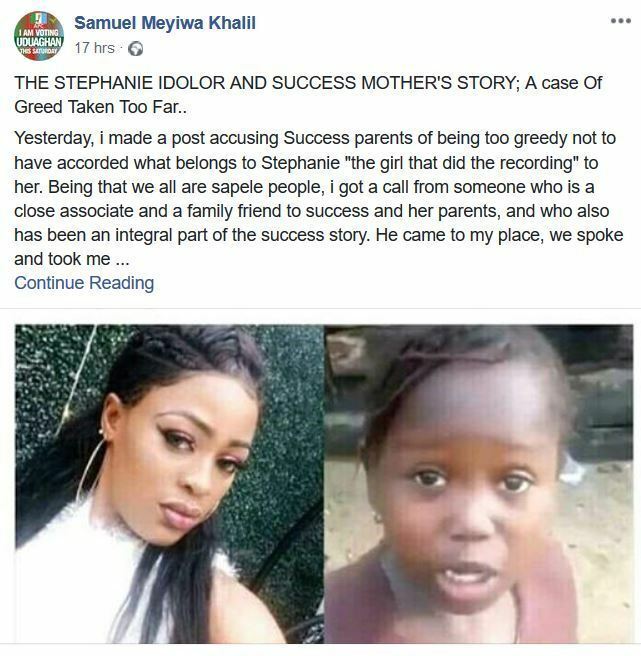 A Sapele based man identified as Samuel Meyiwa Khalil has taken to his Facebook page to narrate what really transpired between Success’ parents and Stephanie Idolor, the lady who recorded Success’ viral video, after she accused Success’ parents of being not appreciative. On 24th March, Samuel Meyiwa Khalil visited Success’ mother to find out what really happened and promised to share the details online. He wrote; Just left Little Success and her mother; took time to ask her salient questions on her purported rift with Steph. 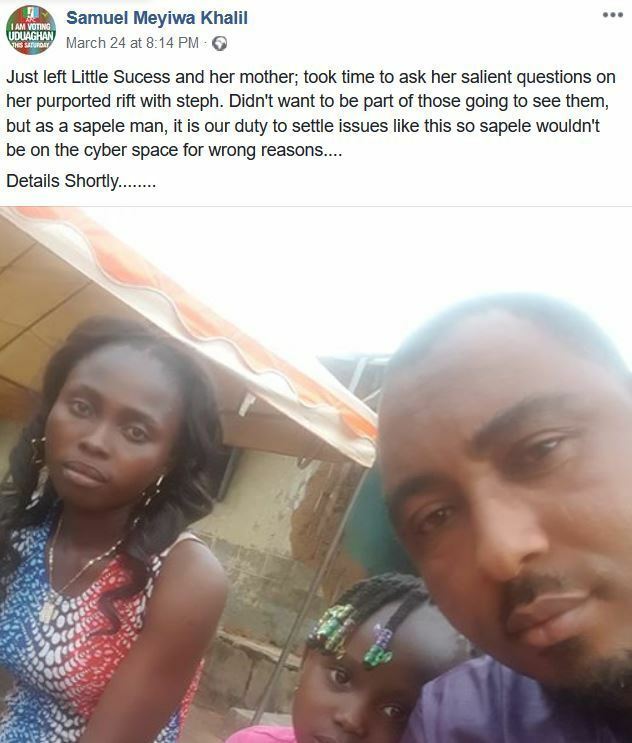 Didn’t want to be part of those going to see them, but as a Sapele man, it is our duty to settle issues like this so Sapele wouldn’t be on the cyber space for wrong reasons…. THE STEPHANIE IDOLOR AND SUCCESS MOTHER’S STORY; A case Of Greed Taken Too Far.. 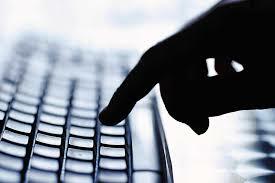 Yesterday, i made a post accusing Success parents of being too greedy not to have accorded what belongs to Stephanie “the girl that did the recording” to her. 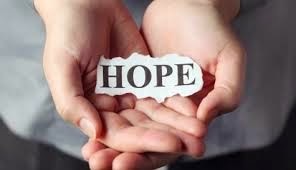 Being that we all are sapele people, i got a call from someone who is a close associate and a family friend to success and her parents, and who also has been an integral part of the success story. He came to my place, we spoke and took me to success mother. Unknowing to me that, Stephanie Idolor whom i was also agitating for to be compensated had done a VIDEO with a Reporter Theophilus Onojoghen who is also my very good friend, complaining to the world that she hadn’t gotten any financial gratification from success parents. Narrating her ordeal, Mama Success said and i quote with whatsapp chat evidence ''we have so far Given Stephanie N570,000, Stephanie only made the video to mock my daughter and myself, she wasn’t even the one that sent to instablog, it was her friend that resides in Asaba a Certain “Joyce Imofen” whom she sent it to, was the person responsible for the VIRAL VIDEO''. First, when Joyce posted the video on instagram ” Stephanie’s Friend in asaba” concerned Nigerians showed interest in supporting Little Success, and some requested Joyce account number, she gave, and the total money she received almost immediately was 70K, not knowing success parents, she called her friend, Stephanie to send her account number, which she did, she transferred the money so Steph could give it to Success mother, to her greatest Surprise, Steph ate the money and gave success mother nothing. So, Joyce opted to speak with Success mother, because she had become the center of all eyes on instagram. She got the account number from her friend and established relationship with Mama Success. Now, when Nigerians started appreciating success financially, Stephanie became angry and trouble ensued with success parents. 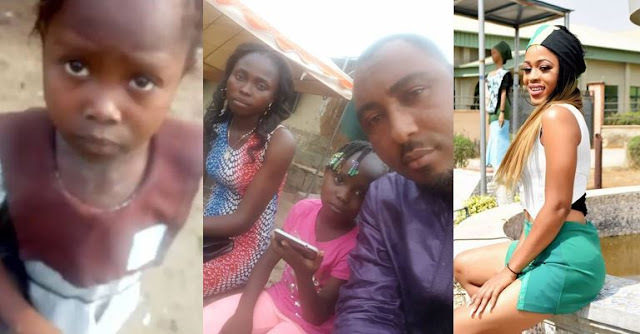 She began to make outrageous demands that she had to ask Mama success to take her to ECO BANK BOYO ROAD, sapele where her account “Mama Success” is domiciled to go and check the account balance so they could give her her share. Success mother being an ignorant woman took her there and discovered that about 700K had been paid, she withdrew 400K and gave to Stephanie, reason being that, steph had said the people involved were so much and she had had to settle everyone person involved. This time, she took the 400K and didn’t give the girl “Joyce” who blew the video a KOBO. She kept making demands, that at a point, she went to ECO BANK to demand the statement of account of mama success but the bank refused; when she discovered that the bank wouldn’t oblige, she went to mama success took her to the bank and almost forced her to open a JOINT ACCOUNT with baby Success so she could control EVERYTHING that comes therein. When this didn’t work, she granted an interview with Punch accusing Success mother of not being appreciative. At this point, she and her sister had gone to fight with Success mother and father demanding they open the joint account with success, but the parents refused, saying things they get was to take care of Success and not to be shared after giving you so much, that Chairman of sapele LOCAL Government advised her against it and promised to give Stephanie a job. Now my question is, Stephanie has been collecting so much from spirited Nigerians, she has not given a dime to Success, but wants to share everything that comes to success with her. I dont think money is still coming for this littel girl. These things na time and it fades away. Let the girls mother invest some of the money and fix some. she shud even pack out from that vincinity pls. Is this one a journalist? so he left his house just to go and ask them what happened so he can post it on Facebook. This one sef wan collect him own/share. The thief (stephenie)who made that video is a 419. Someone should get her arrested before she will scan the family or even kill them. She is a runs woman...street girl. Stephenie is an original thief, 419. She won't let the success family rest...always looking for more money. Make God punish her for been so greedy. Someone should get her arrested before she will use boys to kidnap the little success for money.intact they should complain to police that she is threatening their life. I was defending her before, not known she been receiving money. Thief. I am over with this story joor. My happiness is that all parties involved have been compensated. Last last everyone will be fine. Na wah oh!!! If this is the real story then that joy is a thief!!! How is Joy a thief? Joy is not the thief. It is Stephanie, her friend. @ Onah, thanks for the correction. Hahahahahahahaha. Poverty is bad for real yo! All these coulda been eliminated if Success education was just taken care of without giving her or her family money. I said it that Staph of girl na oje! i dont believe this story! I've never really been interested in this story, so I'll just pass. Steph is a thief! Why should she even ask for money in the first place seeing that the parents of the little girl can't even pay her school fees. She should leave them alone and let them enjoy their money in peace. We need the whole truth. Stop threatening to publish the Whatsapp chats. Instead, just publish it. We need to know who is saying the truth and who is only manipulating the media for some selfish reasons. I never really understood the need to ask for compensation. You were an instrument for a little girl to get help with education so why the need to be compensated for that? I think it just speaks so much about the lady's character. Do good because it is good to be good not because of what you would gain from it. Every good deed sown has a way of coming back to you no matter how long it takes. 👍👍👊like both comments 12.23 & 18.24. I was not happy she was looking for compensation. She should have waited and accepted anything the family decides to give her as appreciation. Which i know, they would. Now, it looks like a scam, which will discourage kind hearted people to help again. I hope success family invest well for her future and ENOUGH OF THE SPOTLIGHT ON THEM! 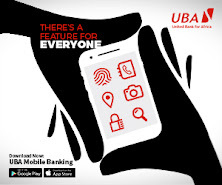 Can you withdraw 400k at the ATM from an individual account? Very good question. Maybe it was collected at the counter. God is not mock, whatsoever a man sow he will surely reap. It is a matter of time. I see a smear campaign going on here, now Stephanie is a runs girls...so what? I believe this bunkom that posted this is blackmailing her for his own cut. how dare a woman be this smart!!! You should ask yourself ,who is this young man? shut your mouth...e dey pain you as she be your fellow runs girl na. idiot..so nobody can help without reason again. From the moment I heard about the lady that video little success, that she was asking for compasation, I knew something was wrong. Ohhhh, I said it. The moment she made that video and mentioned at least 1 million, I knew she didn't have the girl's interests at heart at all. Of course people rushed to condemn the girls parents...as if Nigerians raised money for the parents. All who donated, donated for the girl's EDUCATION. Not for the parents, not for a stephaine, but to ensure that this little girl, gets all the education she desires up to university level. But now the $$ will finish before she gets to secondary school. Sometimes your compensation is not money, it is seeing the impact of the good you did. I would have been happy that this girl is getting a lifetime scholarship, that is compensation enough. She do not have shame! She has no good thought towards success. Instead of she to be put on a pedestal by success family and Nigerians she is being disgraced because of her greed. Success'sMother is a proven liar and almost certainly a manipulative greedy woman. Imagine the idiot! Demanding they open joint account for her to control the money! What rubbish! Is the money not meant for the little girl's education and to cater for her needs. People are just to greedy!